From the experts at Delta, this top-grade showerhead brings you a great clean from head to toe. Made for all-around use, its 2-in-1 design gives you an all over clean every time. Measuring 2-inch D, 9-inch H, and 4-inch W, this showerhead offers gives you plenty of water and takes up little room. This chrome riser and showerhead adds a simple elegance to any space. The three piece set includes a matching wall support, ensuring that you're ready to go out of the box. The exposed installation adds charm and grace, while the delicate showerhead keeps Also available in store by special order only see store for details. Relaxation comes easy with the Rainshower Cosmopolitan 310 showerhead. Though streamlined in look and slim in profile, it is high-tech-driven to provide soothing showers on demand. Oversized, it features a 12 inch Dia spray face with 208 spray nozzles, and GROHE DreamSpray features advanced shower engines to deliver precise and consistent water distribution throughout any spray pattern for an unparalleled and custom showering experience technology, which optimizes water distribution for consistent coverage. GROHE SpeedClean protects the spray nozzles against limescale buildup making cleaning effortless. The showerhead has a flow rate of 2.5 GPM at 80 psi and is recommended for use with a variety of GROHE Rainshower shower arms. Equipped with a ball-and-socket joint, it can be adjusted by hand to aim the water for more targeted showering. The Magnetix Hand shower and rain shower combo is a snap to use. This innovative magnet docking mechanism offers easy release and return, even with your eyes closed. The Chrome finish is highly reflective for a mirror-like look that works with any decorating style. ActivTouch 8-Spray Showerhead in Chrome From the experts at Delta, this top-grade showerhead brings you a great clean from head to toe. Made for all-around use, its 2-in-1 design gives you an all over clean every time. 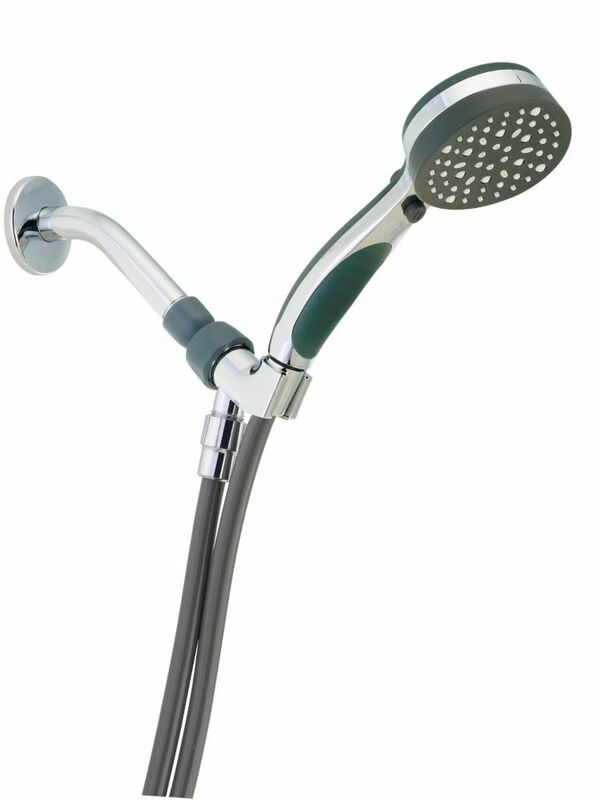 Measuring 2-inch D, 9-inch H, and 4-inch W, this showerhead offers gives you plenty of water and takes up little room. ActivTouch 8-Spray Showerhead in Chrome is rated 4.5 out of 5 by 6. Rated 5 out of 5 by Tall man from Happy Ending I bought this today, My wife and my son are very happy during shower. They both thumbs up for this product. I am happy if they are happy. Rated 3 out of 5 by SThomas from Functional but quality lacking We’ve been using this for 2 months. Ultimately it works well and there is adequate spray selection to find a comfortable setting/intensity. As others have stated, the hose is a lm unaesthetic stiff matte grey plastic that is of poor quality. Our unit leaks at the junction of the head and the hose slightly when the shower is running but this doesn’t impact function. The “pause” button cuts the flow to about 10% of maximum but it continues to come out. I personally wouldn’t buy again, and will be removing it for home showings when we sell, but if you’re on a budget, this is probably a reasonable choice. Rated 5 out of 5 by Mrpine from Great product! Best of it's type for shower ...imho... Well made and extremely strong...terrific variety of sprays. Bravo! Rated 5 out of 5 by roxanne from great product. This was a gift for my 81 year old father. He wanted a shower head with buttons as he found it was not always easy for him to turn the dial on a regular shower head. This one is perfect. It was easy to install and was ready to go in no time. Rated 5 out of 5 by HandyMom from Excellent Product! I bought this without having any time to do research beforehand and it has been a great purchase. Installation was a breeze and took maybe 30 seconds. The hose is extra long and the strongest spray setting is forceful without being painful. Our hose is chromed unlike the previous reviewer's. Some parts are a black plastic but it still looks upscale - not cheap. I can see this lasting many years! Rated 4 out of 5 by Bill2589 from Good shower head with pleanty of spray options. I think it's a good shower head, with pleanty of options for different spray patterns. The only thing I dislike about it is the hose that comes with it. It is a dark gray in color and is very stiff. Maybe it will relax after it is used for a time, but it could be made of a better plastic that is more fleible and would be even better if it was covered with a chrome colored metal sheath. Good shower head.